Mark Johnson, a member of the 2001 and 2002 USA Long Course Triathlon Nationals Team, chronicles his path to fitness from fatness as he gears up for racing. The SCTA is committed to promoting the sport of triathlon through a diverse level of multi-sport activities, in a fun and supportive atmosphere. Triathlon-related link list, part of worldwideaquatics.coms Water Sports Library. A club to promote the sport of triathlon and multi-sport endurance events in Southern Nevada and build a rock-solid, community club for all levels of fitness. Includes forum, training tools, results, and an officer listing. Results and current Olympic qualification standings, as well as information on signing up for the daily email Triathlon Digest, and annual Triathlon Sourcebook. The National Federation for the Sport of Triathlon and Duathlon in Canada provides information on these sports, race reports, athletes photos and national team information packets. The Triathlon Academy provides triathlon coaching services and camps aimed at multisport athletes of all ages, backgrounds and levels of ability. UKs leading multi-sport magazine bringing news and features on triathlon and duathlon from around the world. PC Coachs training page for triathletes with information on triathlon products, including the Mike Pigg Triathlon Training Plan software and Polar heart rate monitors. Multi-sport magazine bringing news and features on triathlon and duathlon from around the world. Includes information on current issue, forum, and subscription details. Online training for triathlon & multi-sport events with Parametric Training, an Olympic level scientifically proven training system to increase speed, power, and endurance. A North Shore triathlon club in Sydney. Site features world triathlon new and club news. Four season sports center in Virginia. Listing of triathlon and multisport events, local and worldwide. Updated daily. Link list of triathlon related sites. Multi sports summer day camp in Apex for campers ages 5 to 13. Our half-day and full-day campers will enjoy indoor soccer, basketball, deck hockey, and skating. Triathlon news, calendar, race coverage, training tips, forum and links. Contains a variety of pages dealing with triathlon including calendars, tips, news, articles, and results. SEB fitness provide triathlon coaching and sport specific training from beginner to Elite Athletes. Queenslands leading service for triathlon and single sport endurance coaching. Triathletes resource for online registration for thousands of triathlon events nationwide and internationally, from sprint to ironman distance. A unique four-event triathlon with running, paddling, cycling, and cross-country skiing. Held in Mad Valley, Vermont, USA. An ITU and the Pan-American Triathlon Confederation member offering race results, image gallery, news and links. Sports photographer who travels the world. From surfing and snowboarding to triathlon and auto racing. Offering multisport camps, clinics, and triathlon training programs for each individual - all distances. Coaching staff includes USA Triathlon certified coaches. If the business hours of FAT-to-fit in may vary on holidays like Valentine’s Day, Washington’s Birthday, St. Patrick’s Day, Easter, Easter eve and Mother’s day. We display standard opening hours and price ranges in our profile site. 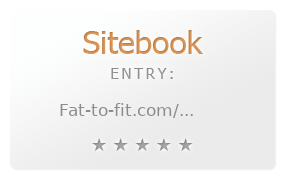 We recommend to check out fat-to-fit.com/ for further information. You can also search for Alternatives for fat-to-fit.com/ on our Review Site Sitebook.org All trademarks are the property of their respective owners. If we should delete this entry, please send us a short E-Mail.